Laundry isn’t my most FAVORITE thing to do. And if you agree, lets’s talk about one way to make this annoying task more bearable, m’dear! A lot of us find laundry to be a mundane task (whenever my husband or I walk past a hamper in the house we yell “Not it!”). And no one wants to do laundry in a hideous space. The solution? A fabulous renovation of your laundry room walls, from drab to fab in a few easy steps. How on earth was I going to be lured into this laundry room when its not stunning?! The wooden accents paired with that plaid wallpaper and border made the room look crazy dated and dusty. It was time for a fresh start. TA DA! A few easy changes totally transformed this room from something that looked like an early 90’s dreadful laundry room into a cheerful and whimsical room for productivity (we even used this as a little office for a while!). Do you like how I used PRODUCTIVITY instead of…. the LR word ;)??!! Makes it THAT much more inviting! After removing the old wallpaper, we painted the walls a cheerful coral with the perfect white designs. 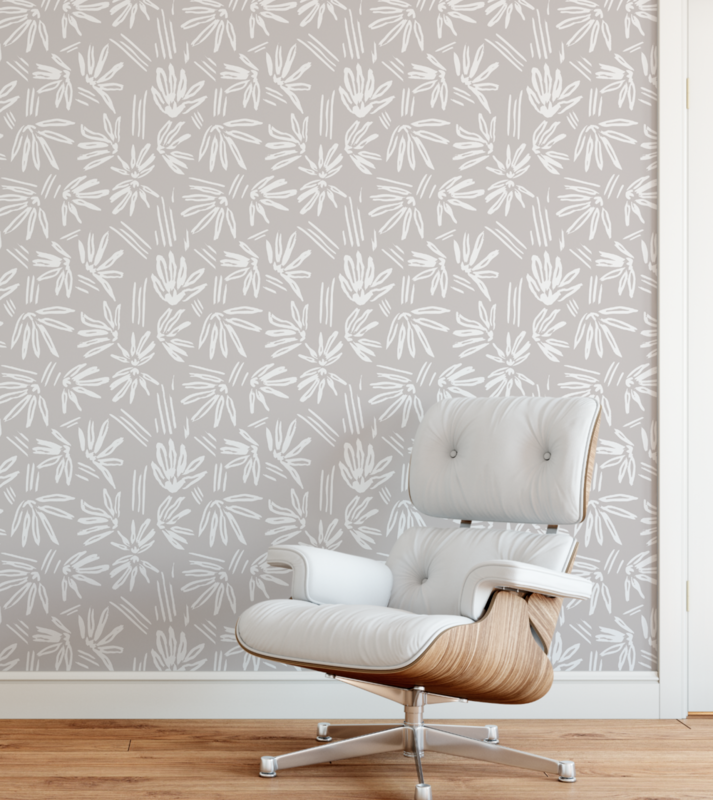 We knew that these walls would be a hit, so we turned them into a wallpaper that you can easily hang yourself, available in pre-pasted and peel-and-stick format. And guess what we named it. LAUNDRY! Next, we installed (and to be very clear, by “we” I mean ME, ha) a simple black Ikea shelf for artwork and a cute black coat hanger (world market), to keep things organized. A couple of floral paintings helps to create a feeling of freshness. On the left, the green of Dinner Party (and the green chair pictured above) works as a compliment to the pink walls. To the right, Growing On You echoes the vine-y design on the walls. These are both available for you at CopperCornersArt.com. Adding artwork really gives this space that extra va-va-voom! 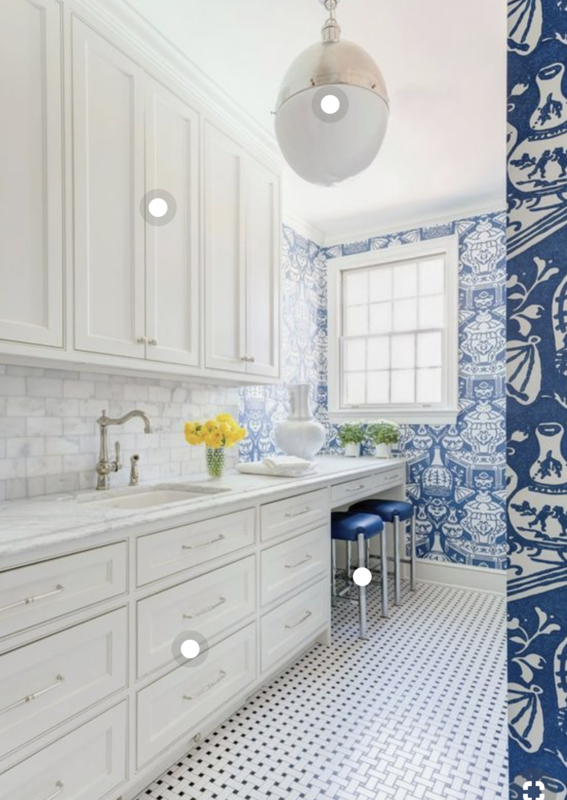 There are so many things you can do to transform a laundry room, especially when you get wallpaper involved. Even if you only have a laundry closet, some wallpaper and artwork make a world of difference. We found a few beautiful laundry rooms for inso for you, and paired them with our favorite CC wallpapers :). 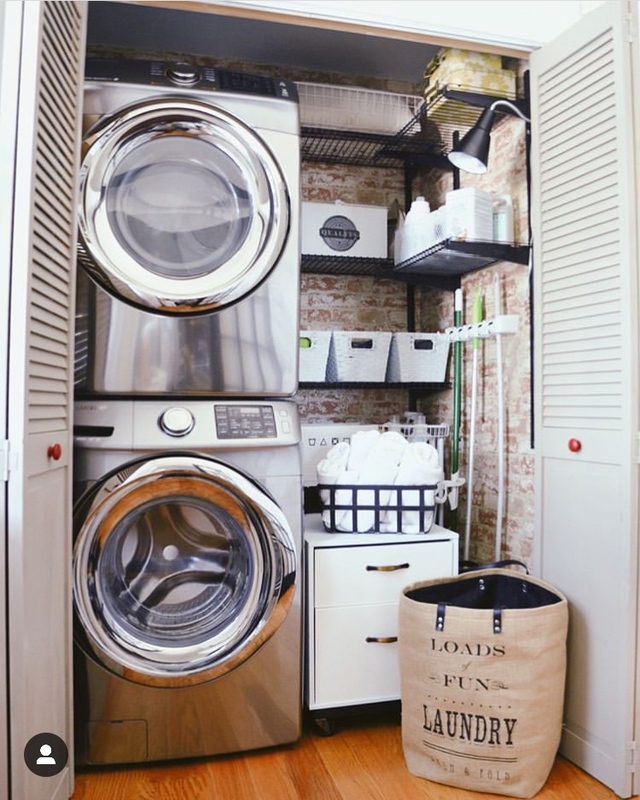 A laundry closet should never get overlooked! Check out this fabulous example below! The clean crisp classic look is a favorite of ours and immediately made us think of Ticking. 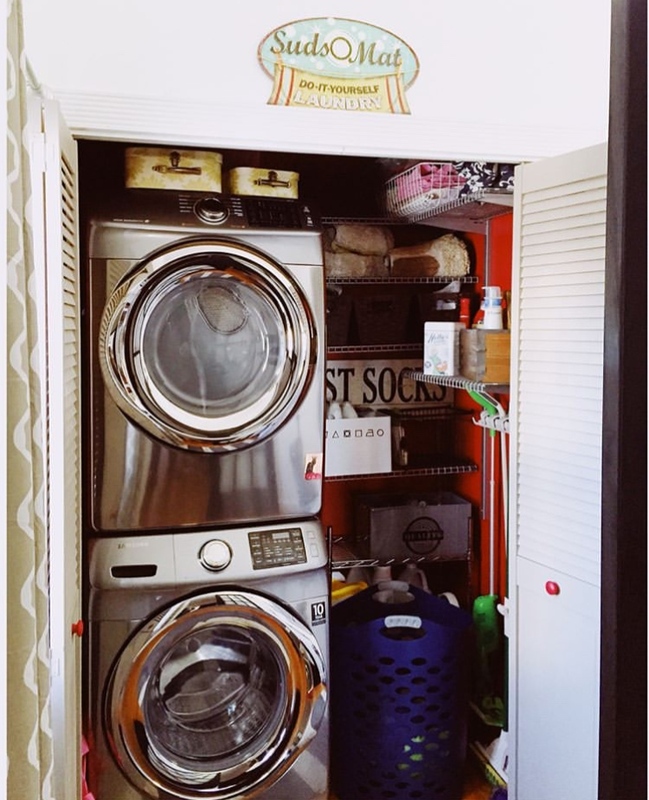 I lived with a basement laundry for 7 years. 7 years of dirty clothes, because you know I NEVER went down there. Funny how that works🙃! 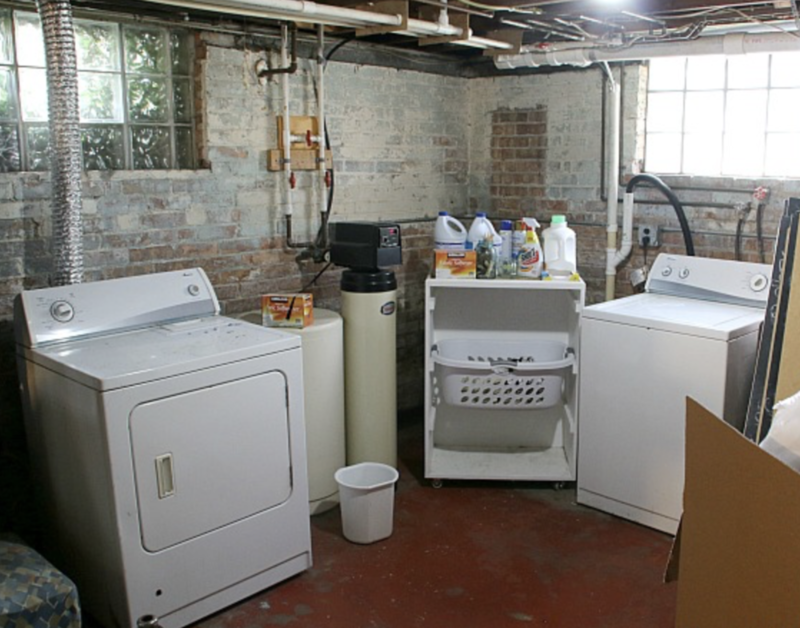 Check out this adorable basement laundry make-over. No wallpaper here, but they did add a beautiful pattern via fabric. Looks like CC will have to get into the textile department soon ;). Love a classic white and navy pattern!! We recommend Love Birds. Do you see the hidden love birds?! At Copper Corners we are firm believers in the idea of “change your space, change your life.”, in other words, change your space and you might go in there, ha! The laundry room always seems to be overlooked when it comes to fulfilling this mantra. We hope we’ve inspired you to seize your chance to have some fun with your decorating! And maybe get some laundry done on the side ;). Check out all of our wallpapers HERE.